Friday, Sept. 30: Picture this, you’ve been stopped on the street by the photographer of Humans of New York, and he asks, “What advice would you give to a large group of people?” Share a picture of yourself along with the advice. Advice? I’m not sure. I would have to say, don’t be afraid to try something new. If I had, I wouldn’t be blogging. I was never really fond of writing when I was in school. This month has been tough, writing something for every day of the month. I’m glad I did it. I’m glad it’s over. If I had not tried quilting, I would not have grown as a quilter and a sewer. If I had not tried hiking, I would have never hiked the mountains of NH. If I had not gotten that cute Brittany puppy, I would have never found the love for dogs I now have. 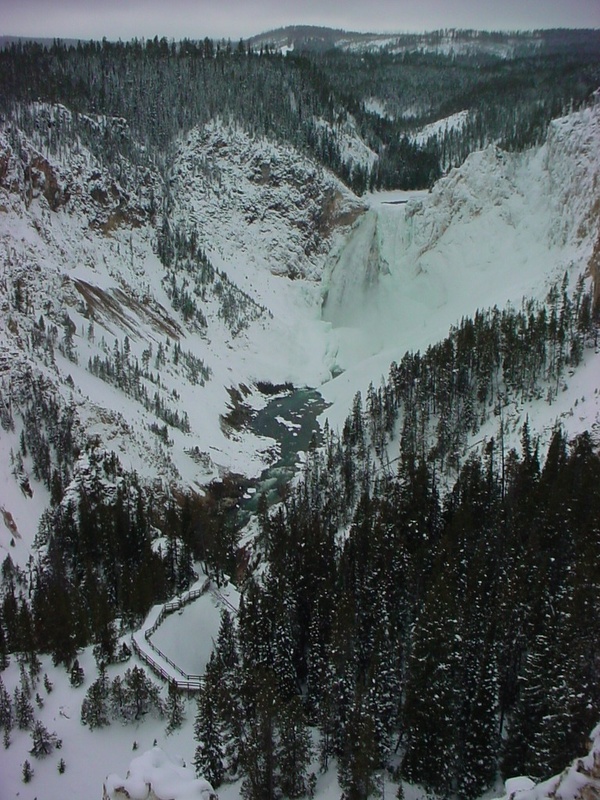 If I had not tried snowmobiling, I would have never gone to snowmobiling in Yellowstone. If I had not joined a local quilt guild, I would not have the friends who understand my need for fabric. Now there are things I don’t think I would ever do. I don’t see myself ever ski diving, bungee jumping, or scuba diving. But I will continue to try new things. What new something have you tried lately? I want to make a quilt for a fund raiser for the Baker River Valley Snowmobile Club. My idea is to use the signs along the trails as blocks. But how do I make those signs into quilt blocks. I don’t applique well. I don’t really want to embroider it. I thought about using crayons. But then I saw an episode of Quilting Arts TV demonstrating screen printing. I knew that would work for this project. I knew I had some iron-on vinyl used in this process. All I would need is organza and ink. I have been trying to complete the new craft challenge without spending a lot of money. So this was perfect! This is the result. I wrote out my whole process. It’s available here as a free PDF, if you are so inclined. Also, check out the Quilting Arts TV (season 16, episode 5), if you can. The episode shows how to add color to your screen print. The dvd is available on amazon. Through this process I learned what not to do. If you have a large design, don’t scribble the whole design with permanent marker. This is done so the design is visible after you cut it out. My design was large enough that the smell of the marker was potent. It also took a bit to dry. Next time, I’m going to just trace around the design. Don’t screen print in good clothes. Hopefully the black ink will come out of my tan jeans. I put some dish detergent on it to pretreat it. Make sure you have a large enough area to work. I didn’t realize where I had put my card/squeegee. When I moved my fabric over, ink got on the back of my fabric. Make sure your water pan is large enough for your finished screen. I used a pyrex dish I had. It was long enough but not wide enough. I’ll get some of those aluminum roasting pans next time. Make sure you put the vinyl sticky side up. When I put the little dot on for the center of the P, I notice the dot was still on the parchment paper. Oops. I put the sticky side up and pressed it again. No problem. Make sure the screen is taped down and taut. Once the screen sifted on me and made a mess. Good thing I was still in test mode and it didn’t happen on my fabric. The following are products I used and links to amazon, if you can’t find them locally. I purchased polyester organza at a local Joanne’s. Once I finish hiking the 4k’s in NH, I’m going to start on the rest of the signs to make the quilt. Have you ever tried screen printing? Did you enjoy it? I did. But I’m still learning. Tom and I have been married now for 20 years. 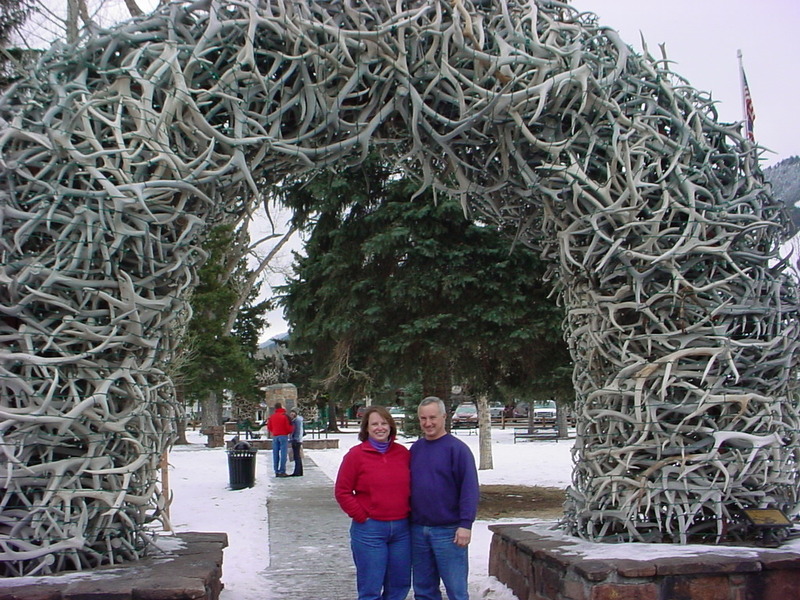 For our 10th and 15th anniversary’s, we went snowmobiling in Wyoming. We decided it was worth a third trip. Our first two trips were to Togwotee Mountain Lodge. Which is a great place. This time we stayed at a guest ranch in Moran, Turpin Meadow Ranch. It may not be a big as Togwotee, but it was much more intimate. The staff actually got to know our names. They were very accommodating. With the time difference of two hours, Tom and I were up before most of the staff arrived at the main lodge. They usually serve breakfast at 8:00 am. They would serve us whenever we got in. Which was usually 6:30 am. Which was actually late by our internal time clocks. But they were very understanding. Our first day there was spend riding the Continental Divide Snowmobile Trail System. They had not gotten enough snow in some of the areas, so they were unable to groom all the trails. But we had 80 miles worth of fun. Of course I found a really deep spot right of the bat. Yup, I got stuck. While I waited for Tom and Luke (our guide) to come dig me out, I took pictures. The snow was up past my thighs. You don’t realize the altitude difference until you have to dig a snowmobile out of 3 feet of snow. You get winded very easily. But Luke got the sled out and we were on our way. The second day was spent in Yellowstone National Park. Our guide was Casey. You cannot ride in Yellowstone without a certified guide. We did what is called the Loop Tour. 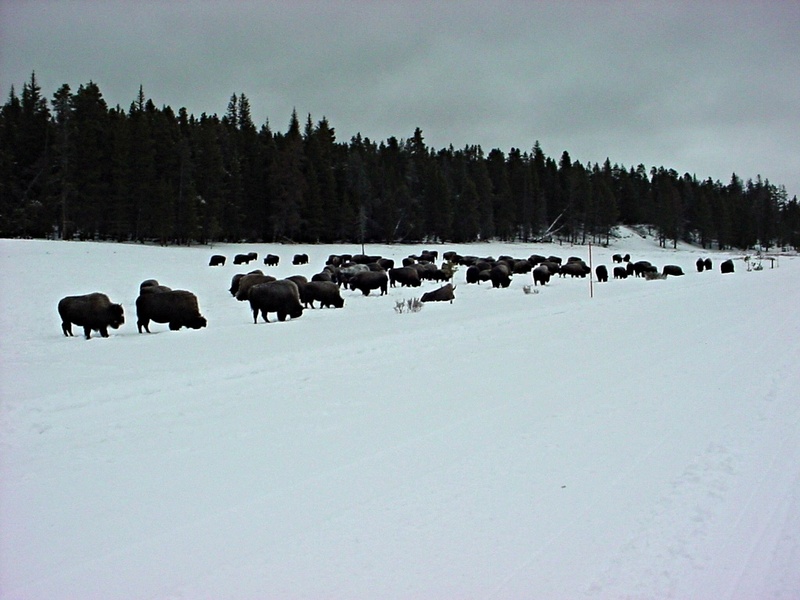 We stopped to take pictures of a herd of bison resting along Yellowstone Lake. From there we rode up to the Lower Falls viewing area. 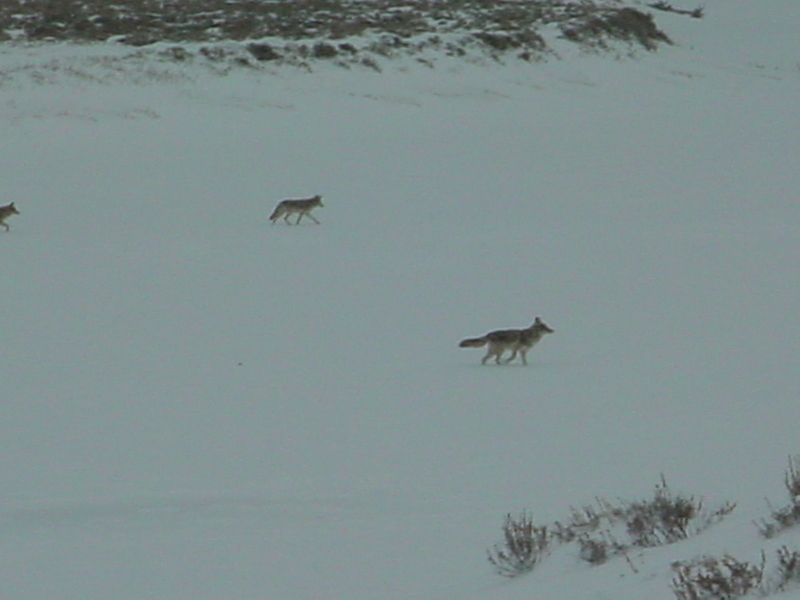 We saw coyote along the way. Our last stop was Old Faithful. The whole loop is approximately 150 miles. It was a great ride, with spectacular scenery. Unfortunately it was overcast and/or snowing most of the time so the pictures are not a good as they could have been. But it’s defiantly a must see. Our third and last day was spent riding the CD trail system. They had more snow and more of the trails were groomed. We did some powder riding. This time I didn’t get stuck. 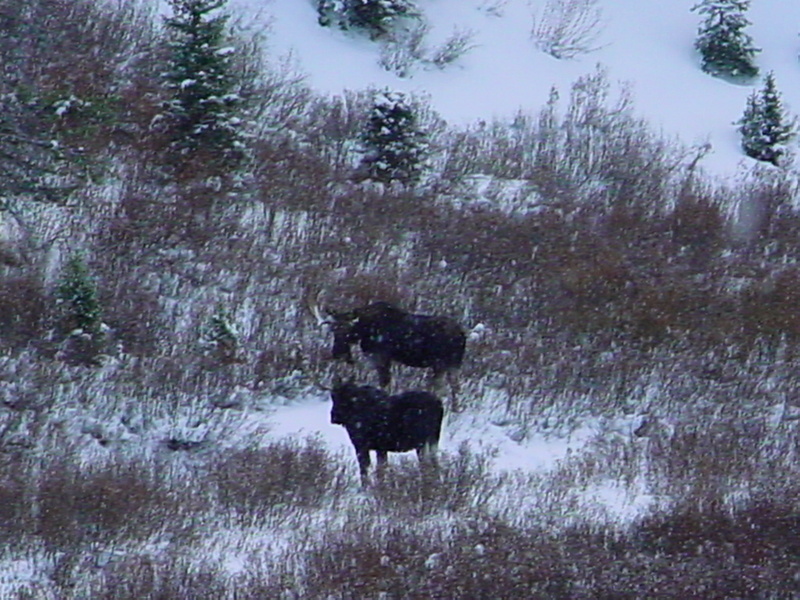 We saw a couple of bull moose. We didn’t think they were going to get off the trail at first. But they eventually moved. You need to give them the right of way. They are just to big to mess with. The weather would go from bright sun to snow. As we headed back to the ranch at the end of the day, the snow really started coming down. I could hardly see 10 – 15 feet ahead of me. In Wyoming, they use long poles to mark the trails. I was driving from pole to pole. I was glad I was on a snowmobile and not in a car. On top of the poor visibility, the light was flat. That means you cannot see the condition of the terrain. I noticed a couple of dips a little to late. But that’s snowmobiling in Wyoming. I would do it again and again and again. The snow they got was wetter than they usually get. 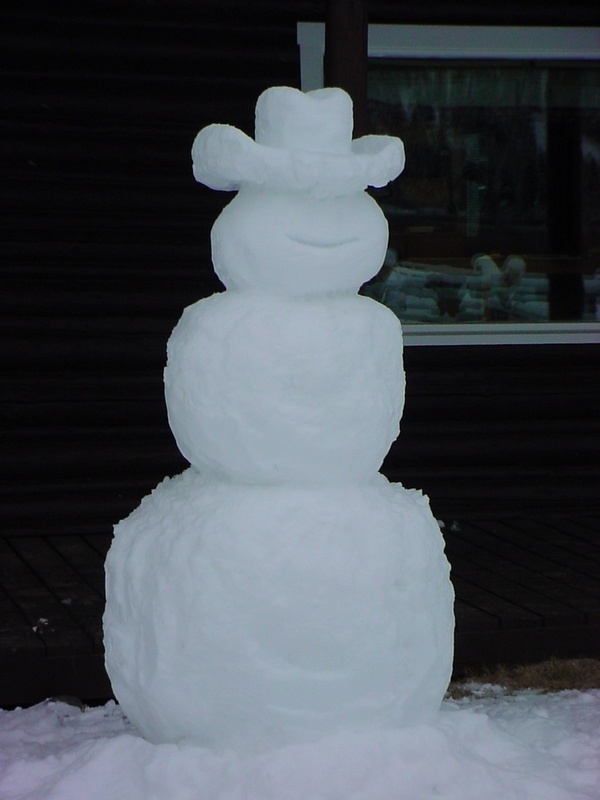 This gave some of the staff the opportunity to make a snowman. Or should I say a snow cowboy. It was a nice way to end our trip. We did about 350 miles worth of riding in 3 days. Great area, wonderful people. 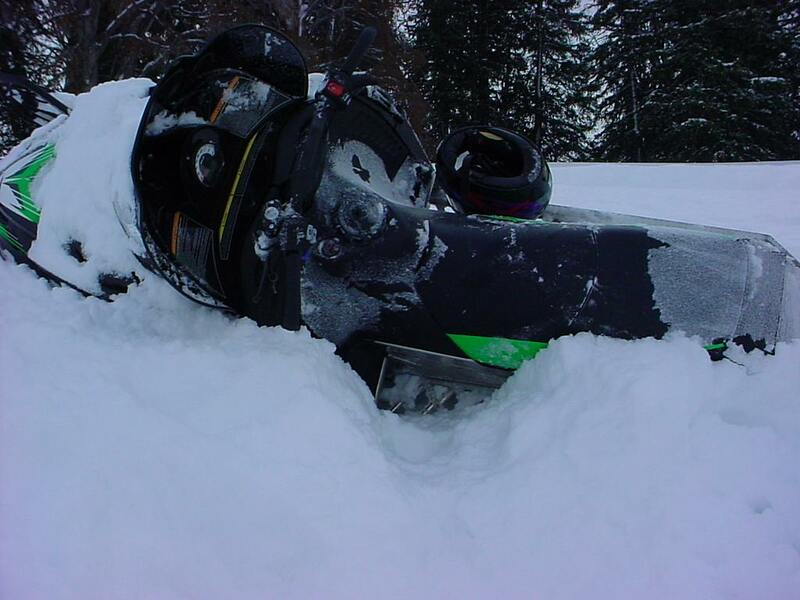 Would I recommend snowmobiling in Wyoming? Most definitely. 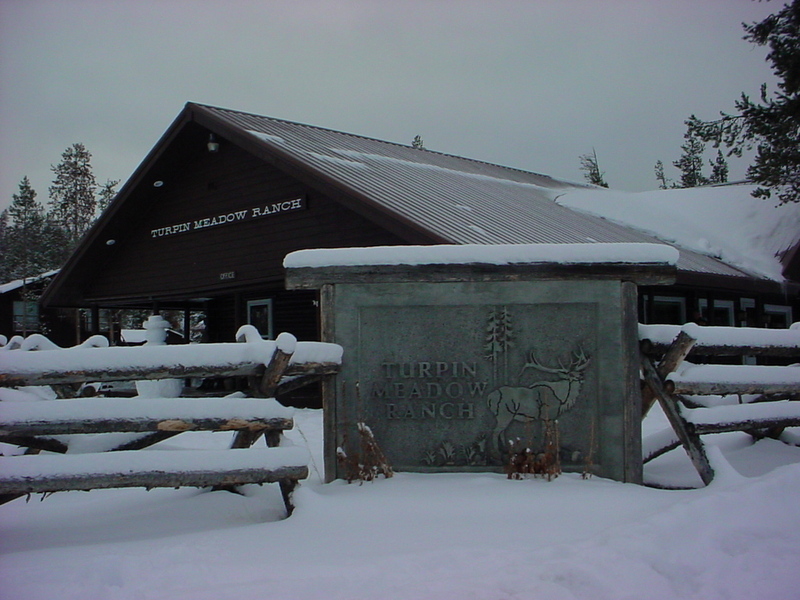 Would I recommend staying at Turpin Meadow Ranch? Whole heartedly. The gathering of snowmobiles at the club house. 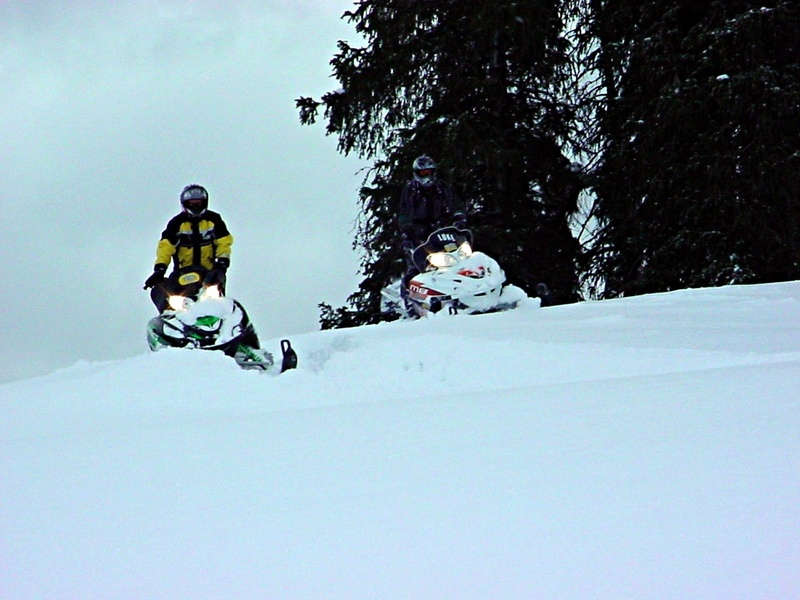 This past Sunday (3/15/09) was the last vintage ride of the season for the Baker River Valley Snowmobile Club. We had quite a turnout. There were 31 snowmobiles. We had good weather. The sun was shining all day. It did get a little warm for some of the sleds. The older motors just don’t like the heat to much. Sport and Maggie came with us on the ride. They had a blast. Sport rode with me. Maggie rode with Tom. Sport curled up in between my legs. It felt like he was trying to go to sleep. He kept poking his head out under my arm to watch Tom and Maggie behind me. Maggie on the other hand sat with Tom and watch as the world whizzed by. She loves to have the wind in her face. Everyone got a kick out of the fact that they would just sit with us on the sled and ride. They also enjoyed exploring the trails when we stopped. There is a great look out over the valley where we stopped for a while. I almost had to stay there. The sled I was riding was getting hot and kept on stalling. Then the rope came out of the starter. Tom tried to put it back but found that the starter spring had broken as well. So with help from our friend Greg, Tom wrapped the rope around the starter cup and kept trying to start the machine. After quite a few tries, they got it started. But I couldn’t let it stall or shut it off or I was done. As we were leaving the look out area, I notice Greg was having issues trying to start his machine. But I couldn’t stop to help. Sorry Greg. Ev on her Skee-Horse at the look out. We had a hard time keeping such a large group together. It was the largest turnout of the year. Next time we will probably break up the groups so it will be more manageable. There were a few Rupps. A really nice Polaris and an Evenrude. Ev, the club president, rode a Johnson Skee-Horse. Other makes included Kawasaki, Arctic Cat, Ski-Doo, and Northway. There was even a Johnson Skee-Horse with a caboose. When we stopped for the day I had Maggie and Sport pose for a picture in the caboose. At the end of the ride we all met at Ev’s house. She lives just off the trail. We had a cook out. The weather was gorgeous. No jackets needed. Everyone had a great time rehashing old snowmobile stories. Talking about various sleds they had in the past or have at present. Maggie and Sport tried there best to get food from everyone. I was very proud of my two. They were very well behaved. I can’t wait until next year. The word is spreading about these rides. I’m sure that next year we will have even greater turn out. If you want to see more pictures visit my webshots. Listed under Links on the right. Tom and I had another great day riding the vintage snowmobiles. This time the group started in Lincoln, NH. From there we made our along the bike path through Franconia Notch. We had good representation of many different vintage snowmobiles. Rupps (of course), Johnsons, Mercury, Ski-doos, Yamahas, Arctic Cats and Polaris. There is one I can’t figure out. It’s the orange one. Not sure of it’s make. I’m sure Tom knows but he’s not available at the moment. It was moderately snowing when we left the Whales Tail in Lincoln. By the time we got to the Notch, just past Cannon Mountain, it had lightened up. If you have ever been through Franconia Notch during the winter you know it can be sunny everywhere else and a virtual blizzard through the Notch. But it wasn’t bad in the Notch. It could have been much worse. We only had one break down. Steve’s Yamaha overheated. His Yamaha is a free air and we were going a little slow and it didn’t like it. He had to be towed back. But that’s par for the course with vintage sleds. I almost didn’t make it back myself. After we took a break at the top of the Notch, the Rupp Yankee I was riding got vapor lock and would not start back up. But with everyone’s help, we got it started. The only problem was the throttle cable was sticking. I could let off my throttle and still go 15 mhp. Made stopping a little interesting. As you can see we had a large group. I didn’t take a head count but I’m sure if you visit the Baker River Valley Club site Ev (club president) will have it. As we made our way along the bike path, we took others by surprised. There were allot of double takes. I even got a thumbs up from some one. It’s just like seeing an old vintage car. It’s fun to see how far we have come with the technology. It’s fun to ride the old sleds once and a while but I can cover more mile with ease and comfort with my newer Ski-doo. Granted it’s no the newest thing out there but it’s a lot more comfortable to ride than the old Rupp.